Pepperwood partners with the Santa Rosa Junior College to offer the annual Stephen J. Barnhart Herbarium Internship that empowers students to lead a research project based at our preserve. 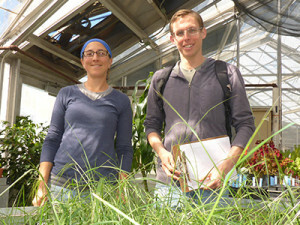 Students gain critical hands-on experience and make a significant contribution to Pepperwood research! Applications for this internship are available through the SRJC Scholarships Office. exploring the impacts of cattle grazing on Purple needlegrass. 2014 – Prahlada Papper, who established Pepperwood’s Phenology Project transect and is now a PhD candidate at the UC Berkeley Department of Integrative Biology’s Ackerly Lab.